Although most have not heard of Bergen, Norway, you should have. Let me tell you why in one day, I fell in love with Bergen. Norwegian Air routes many flights to Europe through Bergen, as well as Stockholm, Oslo, and Copenhagen, so it’s not too hard to stop by for a bit. We had a full 24 hours (before our TransAtlantic flight was delayed) to explore this misty, little town in a fjord. 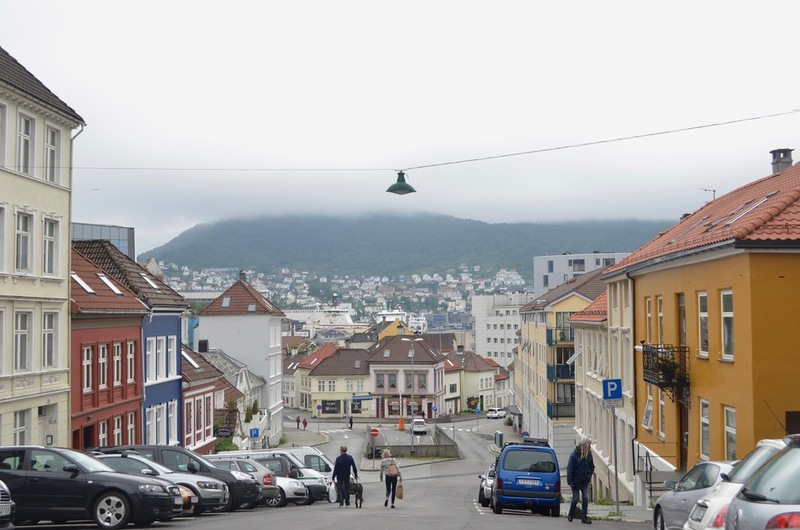 In the summer time, a day or less is certainly enough in Bergen because it stays light for nearly the entire day. Like most Scandinavian countries, Norway is on the expensive side. So my friend and I decided to book one night in a private Airbnb room, which ended up being perfect. Bergen is quite walkable as it’s not that big, so it’s not necessary to be in the middle of the city in a hotel or one of the few hostels. First, you must walk Bryggen if the weather is good. This is the area by the harbor, where ships are docked amid black water and old wooden houses line the boardwalk. One of the buildings is 300 years old and the organization of the piers and settlement date back to the 14th century. We ran across fresh seafood and a farmer’s market here, which was a delightful place to grab a snack. We also recommend that you explore down a side street or two between the historical buildings. Here were small shops and artist’s stalls. We also found Sakristiet, a cafe that gave us incredible open-faced sandwiches, that were basically salads because they were covered in so many fresh veggies. Our meal looked so good that people actually stopped to stare or pop into the shop themselves. Next we went deeper into the town and rode the cable car up a mountain. There are seven mountains that surround the town of Bergen, as the origins of the city name mean 'a meadow among mountains.' I imagine you could hike, but if you are short on time the cable car is simple and worth it. At the top, there is an excellent lookout with a cafe. I enjoyed walking around, to see different parts of the valley below and to find more peaceful and less crowded niches from which I could view the landscape. This landscape happened to include a goat—they keep a handful of goats on the mountain below the viewing deck acting as natural lawn mowers on the steep sides. The top of the mountain is a great place to sit for a while feeling peaceful and writing postcards, because of the natural beauty that envelops one there. After that we rode the cable car back down into the city and started walking until we were considerably lost. We got a feel for the city, pristine and very safe. Our best find was when we returned to the main park to find a mix between a slack line and tight rope, where we could practice our circus act. For a late night snack or supper (our circadian rhythms were very confused at this point) we stopped by a Spanish tapas restaurant, Escalón, in town that was good. Also we wandered across a local joint, Trikken 106, that served as a bar and coffee shop that was good for a hot drink in the chilled air. When we fell asleep, it was still very bright outside, but we pulled down the blinds and let a long day end.